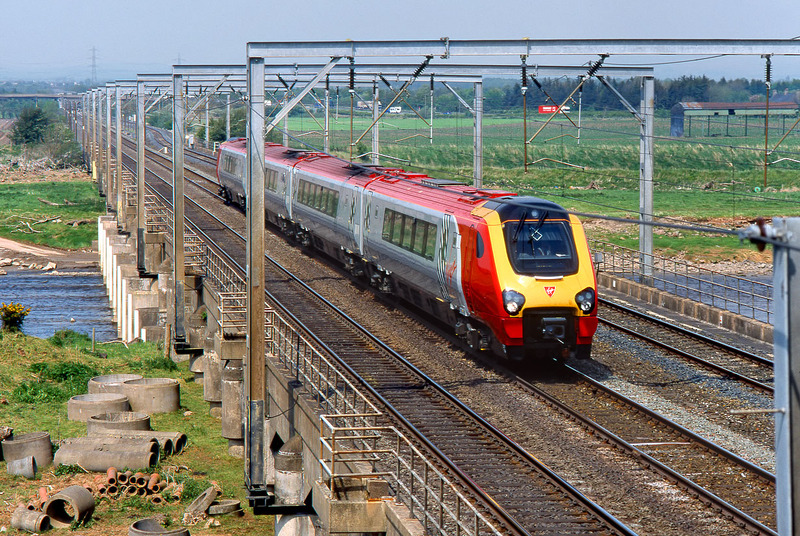 221104 Sir John Franklin passes Metal Bridge (between Gretna and Carlisle) with the 1V52 11:20 Glasgow Central to Penzance Virgin CrossCountry service on 17 May 2002. The name Metal Bridge does not refer to the bridge the train is crossing, which apart from the ironmongery above rail level, is mainly concrete. It refers to the bridge that Thomas Telford built over the River Esk just to the east of this spot in 1820. This was replaced by a concrete structure during the First World War, which was itself replaced by a wider bridge in 1970.